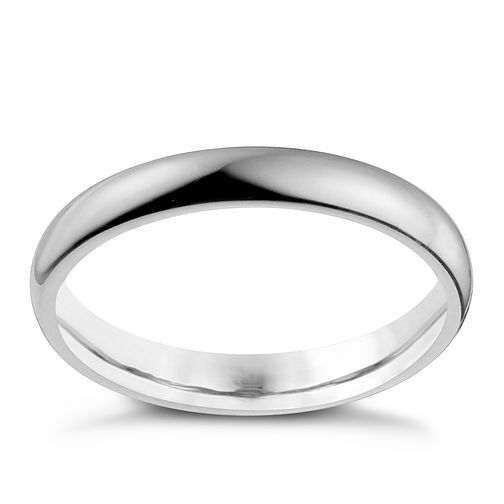 A sleek 9ct white gold super heavy band ring measuring 3mm. Crafted into a rounded, court shape for extra comfort. Makes for a classic wedding band or versatile ring for everyday wear. 9ct White Gold 3mm Super Heavy Court Ring is rated 3.5 out of 5 by 2. Rated 5 out of 5 by Anonymous from Very Comfortable Great little ring for the price, heavy weight, well made yet still very feminine and petite. This ring looks lovely against my white gold diamond engagement ring. Very pleased with my purchase. Would recommend. Rated 2 out of 5 by Anonymous from Disappointing This ring is not even a heavy court and certainly not super heavy! Hardly has any depth to it. Was worn for a month and looked scratched and shabby. Have now purchased a proper super heavy ring online for half the price of this one.